Former Indian skipper Sourav Ganguly has said that Sachin Tendulkar wants the two points against Pakistan while he wants the Men in Blue to lift the 2019 World Cup. His response came after Tendulkar had stated that he would hate to see India concede two points to Pakistan at the global event. Ganguly affirmed, "He (Sachin) wants two points against Pakistan, I want the World Cup." The legendary skipper also went on to say that current captain Virat Kohli has no control over the matter and that all he can do is continue the good run. 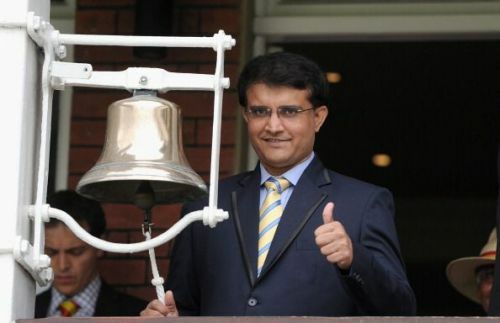 Ganguly reckoned, “I think that is the way forward. He (Kohli) does not control all these things but the thing which he can control is the way his team has played so far and can play in the future. They are a phenomenal side and they have played absolutely superb cricket for the last six months." In wake of the Pulwama terror attack in which more than 40 CRPF personnel lost their lives, the upcoming tie between India and Pakistan at the World Cup came under clouds. The much talked about clash has been slated to take place on June 16 in Manchester. Tendulkar had previously stated that he would hate to see India concede two crucial points by not playing Pakistan at the World Cup. According to him, such a move will only benefit India's rivals. Apart from Tendulkar, former great Sunil Gavaskar too echoed the same sentiments. Ganguly had earlier said that India should cut all sorts of ties with Pakistan. He feels a strong message needs to be sent. A decision is yet to be made but skipper Kohli had said that his team will stand by government's decision. The CoA have sent a letter to ICC asking the body to isolate Pakistan from future cricketing events. A decision is yet to be made on the same. The Indian team will play Australia in a limited-overs series as a build up to the World Cup. Pakistan, on the other hand, will play Australia in a series of five ODIs next month. The 2019 World Cup will begin during May and will take place in venues across England.